Scientists at Yale University reveal promising new target for drugs to treat type 2 diabetes. 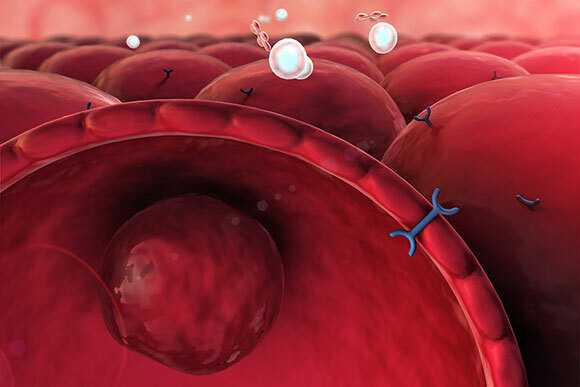 When the body’s cells don’t respond normally to insulin — a condition known as insulin resistance — blood glucose levels can increase, resulting in type 2 diabetes. Researchers have long known that insulin resistance is linked to defects in the insulin receptor (which controls glucose uptake) in multiple organs, including the liver. To study the underlying mechanism, a team of researchers led by Narendra Wajapeyee, assistant professor of pathology, and Gerald Shulman, professor of cellular and molecular physiology and internal medicine, used a genomic technique to screen more than 600 proteins. They found that one of the proteins, MARCH1, impairs insulin by promoting the breakdown of the insulin receptor on the cell surface. MARCH1, which is increased in obese individuals, could be a promising new target for drugs to treat type 2 diabetes, they said. Lead authors on the study were Arvind Nagarajan and Max Petersen. Insulin resistance is a key driver of type 2 diabetes (T2D) and is characterized by defective insulin receptor (INSR) signalling. Although surface INSR downregulation is a well-established contributor to insulin resistance, the underlying molecular mechanisms remain obscure. Here we show that the E3 ubiquitin ligase MARCH1 impairs cellular insulin action by degrading cell surface INSR. Using a large-scale RNA interference screen, we identify MARCH1 as a negative regulator of INSR signalling. March1 loss-of-function enhances, and March1 overexpression impairs, hepatic insulin sensitivity in mice. MARCH1 ubiquitinates INSR to decrease cell surface INSR levels, but unlike other INSR ubiquitin ligases, MARCH1 acts in the basal state rather than after insulin stimulation. Thus, MARCH1 may help set the basal gain of insulin signalling. MARCH1 expression is increased in white adipose tissue of obese humans, suggesting that MARCH1 contributes to the pathophysiology of T2D and could be a new therapeutic target. Be the first to comment on "Study Reveals a Promising New Target to Treat Type 2 Diabetes"